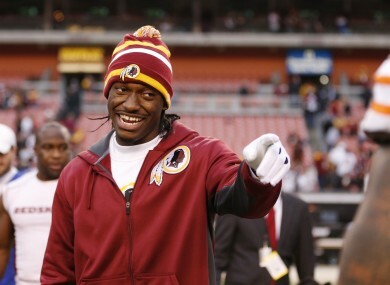 Washington Redskins quarterback Robert Griffin III was the subject of Parker's comments. IN POSSIBLY THE longest Twitter update ever written, ESPN analyst Rob Parker has apologised to Washington Redskins quarterback Robert Griffin III for comments he made on the network last week. Parker, who has been suspended by ESPN since he made the remarks, called RGIII a “cornball brother” and went on to say that Griffin is “black” but is “not really down with the cause. He’s not one of us”. However, on Wednesday, Parker admitted he had made a mistake. “I blew it and I’m sincerely sorry. I completely understand how the issue of race in sports is a sensitive one and needs to be handled with great care. Parker went on to say that while RGIII’s success as a black quarterback warrants discussion, his mistake was how he presented his own thoughts on the subject. Parker finished his 230 word tweet by saying he hopes to personally apologise to the quarterback. “Perhaps most importantly, the attention my words have brought to one of the best and brightest stars in all of sports is an unintended and troubling result. Robert Griffin III is a talented athlete who not only can do great things on the field, but off the field handles himself in a way we are all taught – with dignity, respect and pride. Whether or not the apology will be enough for Parker to be reinstated by ESPN, remains to be seen. Email “ESPN analyst apologises to RGIII for 'Cornball Brother' remark”. Feedback on “ESPN analyst apologises to RGIII for 'Cornball Brother' remark”.